My church holds to the Presbyterian confession of faith, shorter catechism, and larger catechism, believing them to be faithful summaries of the Bible's teachings (see here). 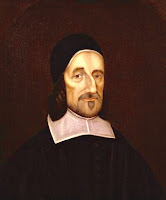 They were written by the Westminster Assembly, which met in the 1640s. Yet these were not the only catechisms in use, since a catechism was a common tool used by pastors to teach the doctrines of the faith. 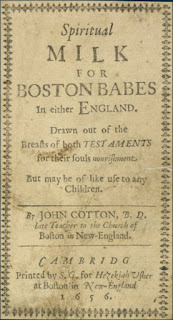 One catechism that was written around the same time was John Cotton's "Milk for Babes," first published in 1646. 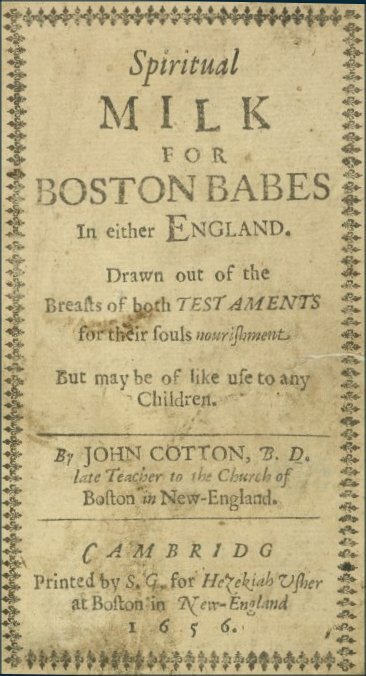 John Cotton (1585–1652) was a Puritan pastor, first in the Boston in England, and then in the Boston in New England, and he wrote the catechism for the children of both Bostons. His catechism is shorter than our Westminster Shorter Catechism, with 64 questions rather than 107, and it was sometimes printed along with the Shorter Catechism in the popular New England Primer during the 18th century. You can read Cotton's full catechism here, but here is his section on the church and the covenant. Even though Cotton was a Congregationalist, these answers are quite similar to our Presbyterian Westminster Confession, especially its chapter 26, "Of the Communion of Saints." In the last question, he does not go into detail how the children of believers receive the seals of the covenant, but he believed (as I do) that they receive baptism even as infants, but receive the Lord's Supper once they are able to examine themselves and discern the body (1 Cor. 11:28-29). The point here is that they are members of the covenant with their parents and received with their parents into the fellowship of the church. I really appreciate the way these answers make use of the covenant in its explanation of the church. My church uses this concept in our name, Covenant Family Church. This covenant is a covenant of grace and redemption, but it also obligates us to live in relationship with God and His people. A. It is a Congregation of Saints joyned together in the bond of the Covenant, to worship the Lord, and to edify one another, in all his Holy Ordinances. Q. What is the bond of the Covenant, in which the Church is joyned together? A. It is the profession of that Covenant, which God hath made with his faithfull people, to be a God unto them and to their seede. Q. What doth the Lord binde his people to in this Covenant? A. To give up themselves and their seede first to the Lord to be his people, and then to the Elders and Brethren of the Church, to set forward the worship of God and their mutuall edifycation. A. By receiving through faith, the Lord, & his Covenant, to themselves, and to their seed, And accordingly walking themselves, and trayning up their Children in the wayes of his Covenant. A. By confession of their sinnes and profession of their faith, and of their subjection to the Gospell of Christ. And so they and their seede are received into the fellowship of the Church, and the seales thereof. Rushdoony makes some pretty important points in this short video. Society is much larger than the state. The reformation of society comes as people are regenerated and begin to be responsible, govern themselves, and live as freemen. Notice and carefully consider his closing comment: "And only so will we take back government from the state and put it in the hands of Christians." The current state is increasingly totalitarian, taking over many aspects of government that are properly distributed throughout society. By living as responsible freemen, regenerated by grace, we can voluntarily take back these functions (e.g. education, welfare) and administer them to the glory of God. The reconstruction of society will include the state, but it will not view its transformation as the key to transforming society in a totalitarian manner. In a free and self-governing society, the state will be reduced to its proper role as one distinct form of government among many. Buddhism is the religion of roughly 488 million people. While most Buddhists live in Asia, Buddhism has gained new attention in the West over the past sixty years. 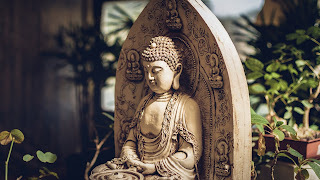 Many Americans, even some Christian Americans, have found some elements of Buddhism to be attractive and have sought to incorporate them into their personal beliefs. Christians should realize, though, that Buddhism differs greatly from Christianity on a basic level and results in a vastly different perspective on life. Buddhism arose in the context of India in the the 6th century B.C. During that time, Gautama (the Buddha) is said to have experienced “Enlightenment” (an experience many centuries in the making through various reincarnations), giving him insight into the true nature of reality. This gave him the ability to teach others how to escape the problem of samsara, the cycle of reincarnation and suffering that formed the background of Indian religious thought. His teaching began with the Three Marks of Existence. Buddha “contended that all things constituting the world as we know it, including persons, are marked by dukkha (suffering), anatta (absence of self), and anicca (impermanence)” (Netland, 61). Life is filled with frustration (i.e. suffering) because all things are continually changing and illusionary and yet we continue to treat things as if they were real and permanent. These marks of existence lead to the Four Noble Truths. These truths are that (1) existence consists of suffering and frustration, (2) suffering is caused by desire, (3) suffering can be overcome, (4) the way to overcome suffering is by following the Eightfold Path (Thompson, 49-50). Because the problem lies with us (we view reality wrongly), we can escape this problem by changing ourselves. Yet, it is difficult to retrain our minds to conform to this new idea of reality. Buddha taught that to free ourselves of desires and to grow in “wisdom,” the Eightfold Path is necessary. Following the Eightfold Path requires one to correctly understanding reality; to have genuine intention to live rightly; to abstain from hateful and selfish speech, actions, and occupations; and to control one’s effort, mind, and concentration (Thompson, 50-51). The Buddhist, by following this path, progressively gains a deeper insight into reality and a deeper freedom from desire and frustration. As Buddha said to his first followers, it is this Eightfold Path “that was awakened to by the Realised One, which produces vision, produces knowledge, and which leads to peace, deep knowledge, Complete Awakening, and Emancipation….to the end of suffering” (Vin. Mahav., 53-54 [I.6.18, 22]). In common practice, the moral component of the Eightfold Path is summarized by the Five or Ten Precepts (depending whether is a layperson or monk) that one vows to follow. The Five Precepts are “1. To abstain from intentionally harming life. 2. To abstain from taking things not explicitly given. 3. To abstain from illicit sexual activity. 4. To abstain from harmful speech (lying, gossip, etc.). 5. To abstain from indulging in intoxicants (liquor or other drugs)” (Thompson, 96). In addition to these precepts, practices such as meditation are common to train the mind to experience the truth. An additional component is added in some strains of Buddhism: vicarious salvation. They would teach that one can essentially take a short cut by gaining from the work of others (usually those who have become Buddhas or bodhisattvas) through faith or devotion to them. In this way, a person can receive the benefits of the Eightfold Path without as much struggle and discipline. For example, in Pure Land Buddhism “Amitabha [a Buddha] promises to help all who mediate or call upon him. Pure Land, thus, was the ‘easy path,’ the way for those with faith in the salvific power of Amitabha” (Thompson, 79). It should be noted that this way of salvation differs sharply from Christianity. In Christianity the root problem is sin, while in Buddhism the root problem is ignorance. Christianity emphasizes that man is guilty and disobedient to God’s law. Buddhism emphasizes that man suffers and is deceived by the illusory nature of this world. “Christianity is addressed to the sinfulness of men, and all the other problems are by-products of that. Buddhism is addressed to the misery of people, as Hinduism and Jainism also are” (Vos, 12). In Christianity the solution involves legal justification and reconciliation with God. In Buddhism the solution involves enlightenment, detachment from reality, and the cessation of frustration. In Christianity good works are caused by, and a response to, God’s gracious work in us. In Buddhism good works are usually done as ways to save one’s self. It is true that there is the possibility among some Buddhists for a vicarious savior received by faith alone, yet this vicarious salvation is still defined by the rest of the Buddhist system and has little to do with the Christian idea of Christ's righteousness being imputed to us so that we may be forgiven and adopted by God. Christianity is centered around God’s person, law, and love. We have rebelled against Him, broken His law, and thus earned His wrath. God saves us by forgiving our sins on account of Christ, bringing us into a loving relationship with Him, and making us more like Him. Buddhism centers around man’s consciousness. The problem is that man is conscious of suffering and the solution is to be free of that suffering by being free of existence. Christianity is a religion that is focused on pursuing something good - reunion and restoration. Buddhism is focused on escaping something bad. Buddhism as a system is not free from internal inconsistencies. For example, it teaches that we should be concerned with escaping the bad effects of Karma that cause us to continue experiencing a distorted view of reality and suffering. Yet, what we experience now is primarily the result of actions in past lives. Much of what we do now will effect us in future lives. Thus, the motivation to do good and escape suffering is at least partly based on the fact of personal continuity between lives. Yet, Buddhism also teaches that persons (including souls) do not exist. “Person” is only a useful label for the collection of things like sensory awareness, conscious awareness, material forces, etc. What is carried on to the next life is not our souls, but only “the positive or negative qualities of consciousness” (Thompson, 49), i.e. Karma. This undermines personal continuity between reincarnations. “This religion tears the motivation out of doing what it wants you to do. It is moralistic, but then it doesn’t really tell you why you should be moral because your Karma is going somewhere else” (Bahnsen, 21). It would seem that the motivation to save one’s self is undermined by the fact that one does not exist as a person. The basis of authority was not in logical argument, but rather experience. Buddha had experienced it, and people would have to trust, just as Buddha had to, that his experience was not illusionary and that it led to true knowledge. Furthermore, Buddha himself taught that his followers should not accept things on anyone else’s authority, but only by one’s own authority. “[W]hen you yourselves know: 'These things are good; these things are not blamable; these things are praised by the wise; undertaken and observed, these things lead to benefit and happiness,' enter on and abide in them” (Kalama Sutta, 10). Knowledge is only verified on the basis of one’s own experience. Buddhism is filled with the tension inherent in sharing and teaching a non-rational personal experience. Besides formal problems, there are other aspects of Buddhism that simply make it undesirable or lacking. As we have already noted, Buddhism is a negative religion. In other words, it is primarily concerned with what it escapes, not with what it pursues. It focuses on cessation and the lack of suffering. This is reflected in its morals, which are all acts of abstaining. It is man’s desire to pursue, possess, influence, enjoy, or reform that causes his frustration. Buddhism is a religion of retreat. It admits defeat in the realm of the world and seeks a supposedly more realistic hope of detachment. It is a retreat from humanity, ownership, culture, rationality, and reality, all things which Christianity holds dear. Its “rest” is surrender and cessation. For Christians, the idea of perfect rest is a Sabbath rest. It is a rest that consists not in mere cessation, but also in the worship of God (Lev. 23:1-3). While Buddhism has tended to think of good as the absence of evil, Christianity has tended to think of evil as the absence or distortion of good. The fact that Buddhism is an escape religion has impacted its social and cultural outlook. While Buddhists teach that compassion is a great virtue, compassion takes the shape of teaching others how to escape suffering through the Eightfold Path. Or perhaps it results in acts of kindness, but only as a way of freeing oneself of desire. It does not seek to construct something positive in society or culture. Art becomes a mere devotional tool or a way to train the mind, not a pursuit of beauty. Economic stewardship and delight in God’s creation are eschewed as forms of desire for what is not real. Science has little basis in a worldview that is based upon the fact that all material phenomena is in constant flux and is an illusion. How then are Christians to view Buddhism? How do we explain it? A fundamental Scriptural passage for understanding other religions is Romans 1:18-32. There we learn that everyone has an underlying knowledge of God and naturally suppresses that knowledge (Rom. 1:18-20). Instead of worshipping God, they become fools by claiming to be wise, teaching false religions in exchange for the truth (Rom. 1:21-23). Since the Christian consensus began breaking down with the Renaissance, Western culture has generally tried to escape this sense of guilt and suppress the truth through secular philosophy or the distractions of entertainment and work. In the West we have been more like the preacher of Ecclesiastes who sought out all sorts of pleasures and occupations to counter the vanity of life. Buddhism, however, has realized the futility of these things. It has declared that all is vanity and actually finds relief in that. Instead, it seeks an escape from reality (which is God’s reality) altogether. The consequence of man’s revolt against God, though, leads to the undermining of one’s self. It leads to death: death of the individual and of culture. The more consistently one rejects God, the more he will cut himself off from God’s reality. As it was with Adam and Eve, sin brings not only God’s wrath, but also exile from the Garden. Romans 1:24-32 speak of representative self-destructive behaviors that result from the rejection of God. In the case of the Buddhist, this suppression of the truth leads to the abandonment of reality. Even sinful pleasures have lost their appeal. The only good thing about life is the ability to help others escape it. The goal is to be beyond life and death–they call this immortality, but it might be better called eternal death. In the end, we should view Buddhism as foolishness, though understandable foolishness. It should stir in us compassion for those who follow it. As Paul’s spirit was provoked within him when he observed the idols of Athens, so should our spirit be provoked when we observe Buddhism and its influence on so many millions of people. We should also be wary of attempts to blend Buddhism with Christianity. Despite superficial similarities, Buddhism and Christianity are systemically different. While studying Buddhism might help us understand other people better, it is certainly not a religion parallel to Christianity. From a Christian perspective we see that a religion of escape, built upon questionable authority, that views existence as pain and illusion, is a pitiful religion. This study should fill us with gratitude for a worldview that is filled with beauty, truth, and goodness. We can delight in the world God has made, worshipping Him as the all-good sovereign, and live in hope of a future glorification. We can endure suffering, knowing that evil is not original, but a perversion that will be eradicated. We can rest, knowing that our hope lies in God, an absolute authority, who can communicate with us freely through His word. His promise is sure, and our Savior is victorious. And finally, our worldview is better, not because we were smarter or anyway superior to Buddha. Rather, we have received this way of life through God’s grace. Grace, that is, and not Karma. Bahnsen, Dr. Greg “Lecture 21 — Methods XI (Buddhism)” A Biblical Introduction to Apologetics. Nacogdoches, TX: Covenant Media Foundation, 2015. Kalama Sutta. Trans. Ven. Soma Thera. Netland, Harold A. Dissonant Voices. Vancouver, Canada: Regent College Publishing, 1997. Pew Research Center, "Buddhists," 2012. Thompson, John M. Buddhism. Westport, CT: Greenwood Press, 2006. Vinaya Mahavagga. Trans. Ānandajoti Bhikkhu. May 2014. Religions. Lakeland, FL: Whitefield, 2008. In Philippians 4:5–7, we are told to deal with anxiety by taking comfort from the fact that the Lord is at hand and by making our requests known to God, the giver of peace. "The Lord is at hand; do not be anxious about anything, but in everything by prayer and supplication with thanksgiving let your requests be made known to God. And the peace of God, which surpasses all understanding, will guard your hearts and your minds in Christ Jesus." the righteous to be moved." Thus, we see a consistent pattern: God's people are not immune to feelings of anxiety, worry, and fear - but they are directed to go to God with these feelings, to seek His help, and to burden Him with these troubles. They are directed to pray with hope, trusting that God cares for His people, that He is near His people, and though for a time you may be humbled and distressed, God will guard and sustain you and at the proper time exalt you. Psalm 55 gives us a more full picture of what this prayer might look like. It is not a bare request. In it, the suppliant does call for help (v. 16), but he also utters his complaint and moans (v. 17). It is a supplication, a plea, an argument. It is emotional and does not hide or suppress the anxiety that motivates the prayer. Verses 2b-8 consist of description. David, the author, describes his situation and his emotional condition. And I say, 'Oh, that I had wings like a dove! Then in verse 16, David begins to do something different. In verses 16-19 and 22-23, he reflects upon and affirms the truth about God. Unlike David's false friend described in this Psalm, God is faithful. David repeats what God has promised to His people and David applies it to himself. It is at the end of this Psalm that David says the words that are reflected in Philippians and 1 Peter. David moves from applying God's promises to himself to applying it to the godly in general. Those who cast their burdens upon the Lord will be sustained by Him (v. 22), but men of blood and treachery, though they seem ascendant for at time, will be cast down by the Lord (v. 23). David's faith has grown by this exercise of faith in prayer. By laying out his complaint before God (instead of simply brooding over it himself) and by applying God's promises to his situation, he has come to a place of greater faith, confidence, and peace. He ends this Psalm with the key conclusion: "I will trust in you" (v. 23). Using this Psalm as a pattern does not mean that you will always be at peace by the time your prayer ends. In fact, this Psalm might be thought of as a pattern, not only of one prayer, but of a series of prayers over a period of time. 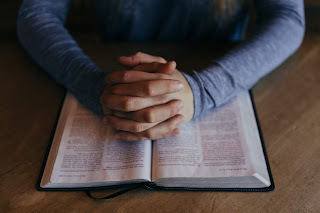 In all of your prayers, you will want to mix in a description of your anxieties, your call for God to act, as well as reflection on and affirmation of God's character and promises. In this way, your faith will be exercised and strengthened. Prayer is a means of grace to the believer, and through it, in His timing, God will send His peace to guard your heart and mind. He will sustain and protect the one who trusts in Him. Catholicity is not defined by union with the Roman papacy, but rather by union with Christ through the Spirit and faith in the gospel. This is what the Bible teaches in passages like Ephesians 2:19-22 and 4:1-16. The catholic (i.e. universal) church is composed of those who share "one Lord, one faith, one baptism" (Eph. 4:5). Notably, in Ephesians 2:19-22, the church is not built upon the successors of the apostles (or successors of Peter in particular) but upon the apostles themselves, along with the prophets, Christ being the cornerstone. The apostolic and prophetic foundation is not to be found in a pretended successor like the pope, but rather in the divinely inspired writings they left behind - the Bible - which finds its center in Jesus Christ, the cornerstone. May all who claim the name of Christ abandon other foundations for the church and build their house on the rock. Upon this rock, Christ will build His church. All other ground is sinking sand (Matt. 7:24-27).